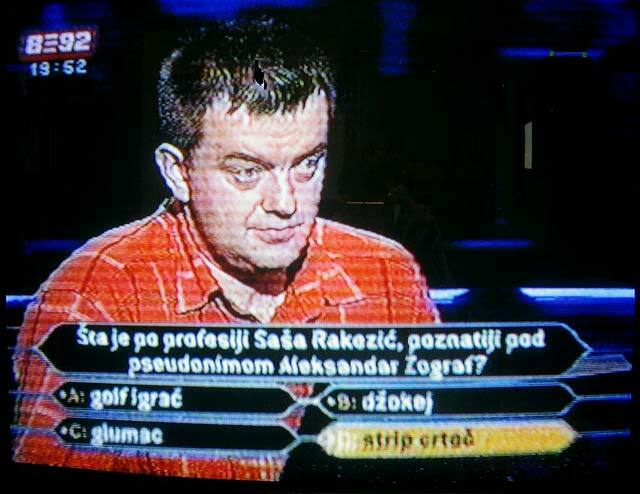 A bizarre occurance was a question featured on the Serbian version of "Who Wants to be a Millionaire" quiz game show: "What is the real occupation of Saša Rakeziæ AKA Aleksandar Zograf? a) golf player, b) jockey, c) actor, d) cartoonist. Guy answered "d" and won 80000 dinar (about 1000 euro)! 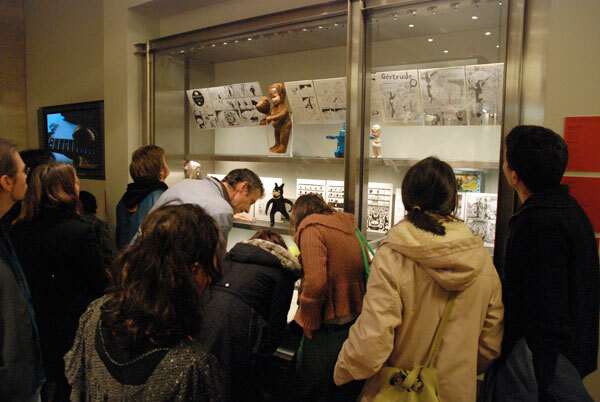 Paris' Musée des Arts Décoratifs’ has seen the opening of the exhibition "Toy Comix" ( 15 November 2007 - 9 March 2008). Dorothée Charles and Jean-Christophe Menu have invited a host of international artists, including Aleksandar Zograf, Jim Woodring, Renée French, Max Andersson, Mattt Konture, Massimo Mattioli, BlexBolex, Caroline Sury and others, who all had to pick up a toy from the Museum's toy gallery department, and create a 3 page story based on it. Both toy and artwork were then exhibited next to an original childhood toy by the respective artists. Zograf's story (Que suis-je?) based on a toy of a "child masked as a teddy bear" was posted inside the expo's press release. 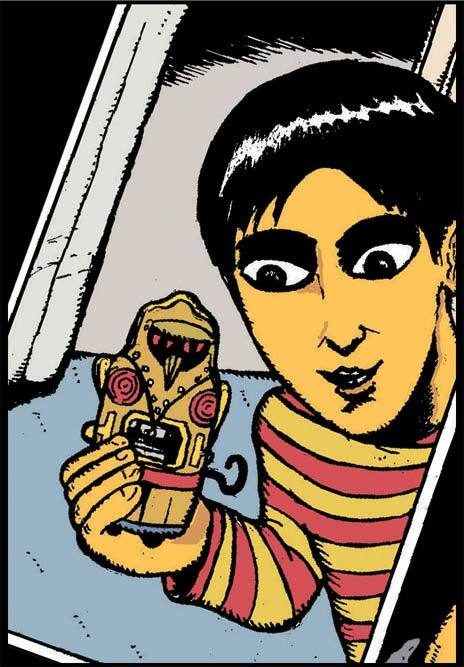 See: http://www.lesartsdecoratifs.fr/fr/pdf/cp_toy-comics.pdf. Moreover, Zograf was proud of the fact that his childhood plaything (a Japanese tin owl-robot) was insured by Lloyds', let alone the fact that it was exposed at one of Paris' major museums (based in an adjoining building to the Louvre)! More information http://www.lesartsdecoratifs.fr/fr/01museeartsdeco/03visite/01parcours/page06-01.html and http://travelmax.kilroytravels.dk/sisp/index.htm?fx=event&event_id=170068. Edition #7 of London's Sturgeon White Moss magazine (http://www.buenaventurapress.com/books/bookSW-7.php) includes a two page story by Zograf (Postcards from Budapest). Among the artists included in this issue are Archer Prewitt, Gabrielle Bell, Cole Johnson, and others. Stories based on Zograf's character named Senko are announced at the blog of the Italian magazine The Artist (in Italian/English):http://hurricaneivan.blogspot.com/2007/11/puck-is-coming-5-le-visioni-di-zograf.html. Speaking of Italy, the web site Voices from the East (Voci da est) is using a logo/banner created by Zograf: http://rivistapaginazero.wordpress.com/category/voci-da-est/. Italian national weekly Internazionale was presented at an event October 5-7 in Ferrara. Along with other features, an exhibition dedicated to Internazionale’s “graphic journalism” line was on display, with works specially commisioned for this magazine by Aleksandar Zograf, Art Spiegelman, Marjane Satrapi, Francesca Ghermandi, Lorenzo Mattotti, Gabriella Giandelli, and many more. One of the October issues of Internazionale featured Zograf’s new two-page story “Postcards from Munich”. As part of the animation film festival Balkanima in Belgrade, a panel discussion dedicated to the history of comics experimentation in Serbia was held. participants included Aleksandar Zograf, Saša Mihajloviæ and Milenko Pajiæ. Two events featuring Zograf’s works were held during October in two European cities: London ( an exhibition entitled Hypnagogism: Dreaming with Aleksandar Zograf at BookArtBookshop, with a booklet featuring an interview with Zograf, all organised by Les Coleman and Paul Gravett, as part of the major COMICA event), and in Vienna ( an exhibition of Zograf’s comics and Gordana Basta’s embroideries was added to Zograf’s slide show, all at a venue called Transporterbar). 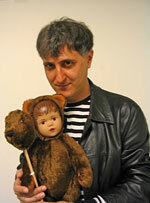 Vienna’s presentation was described as “one of the best in 2007” by Zograf and Basta. October 25th was the date of the release party held in Toronto, where the new issue (#17) of Don’t Touch Me magazine was presented. The magazine includes a two-page story by Zograf, along with comics by Nina Bunjevac, Pascaline Knight (Canada), Ivana Armanini (Croatia), MP5, Franco Sacchetti (Italy), and more. An Italian language interview with Zograf, based around the topic of modern history rather than comics, was posted on Osservatorio Balcani web site.The interview was originally made by Andrea Rossini, for the means of an independently made film concentrated around the topic of the reception of the WW2 events in various European countries. Finally, as part of a collaboration with the Italian Insitute in Belgrade, Aleksandar Zograf was, together with Italian comics journalist and editor Andrea Plazzi, coordinating a comics event at Belgrade’s International Book Fair, held on October 27th. The event was projected to combine the experiences of cartoonist from two countries – Italy (Fabio Civitelli, Massimo Semerano) and Serbia (Darko Perovic, Saša Mihajloviæ, Maja Veselinoviæ), and it all ended with a jolly live drawing session. In another part of the world, in Russia, among the works shown at the expo of new Serbian Art in the Art Museum of Togliatty (July 12th - September 1st) were comics by Aleksandar Zograf and embroideries by Gordana Basta. Other artists included were Škart, Snežana Skoko, Žolt Kovaè, etc. Back in Serbia, Zograf coordinated a comprehensive exhibition titled "A Century of Serbian Comics" ( Gallery of Contemporary Art, Panèevo, September 26th - October 7th).The curator of the show was Zdravko Zupan, and expo included everything from 19th Century protocomics to the most recent comics production in Serbia. The event was designed to be a farewell to the GRRR! festival, after Zograf resigned from working on it. The finale of GRRR! was simbolically dedicated to Alootook Ipellie, (an Inuit artist who was everyone's favourite guest of the GRRR! festival in 2005), who passed away this year, after a heart attack on September the 8th. On September 30th a presentation of a new issue of Silent Wall, the comics poster produced by Vladimir Palibrk, was held ina Panèevo venue called Elektrika.The guest-editor of a Silent Wall was Zograf, who invited three female cartoonists (Lee Kennedy from London, Larisa Ackov from Panèevo and Nina Bunjevac from Toronto) to do a story in which each of them would tell the story of their life, from the day they were born, until the present, in just two strips and no words! The event included a concert by San Francisco band Sabot, currently residing in Czech Republic. Anyone who happens to be in Vienna on October 14th, should visit Transporterbar ( Kettenbrückengasse 1/ Margaretenstr. 54), where at 19:00h Zograf will do a slide show and present comics and embroideries http://www.elffriede.net/zograf/index.html , http://www.transporterbar.com/ , www.machfeld.net - all is co-organised by the ever-busy Elffriede. From June 7th - 26th, as part of the Belgrade's Cultural Center exhibition dedicated to the Serbian writer and poet Stanislav Vinaver (1891-1955), large panels with Zograf's illustrations of Vinaver's poem "Osvestiæu ljude" (I'll Make People Conscious) were on display in Belgrade's main pedestrian street. A Modernist/avant garde writer and translator (it is largely unknown that he even translated some Disney comics for the 1950s Serbian magazines), Vinaver was Rebecca West's guide and inspiration while she was writing her epic Balkan travelogue "Black Lamb and Grey Falcon". A Greek translation of Zograf's comics came out in a nicely bound volume in Athens this June - In another part of Europe, Munich, Comicfestival was hosting a nice exhibition, a chronicle of the history of Serbian comics, titled "From Mika Mish to Aleksandar Zograf" ( Mika Miš is one of the early names for Mickey Mouse in Serbia). Aleksandar Zograf and Gordana Basta were present at the festival, and Zograf did a slide show. Another event where Zograf was present was Italia Wave, a rock festival held in Florence, with its special section titled Comics Wave - along with a round table dedicated to dreams / comics connection (participants included Bryan Talbot and Gabriella Giandelli), Zograf also took part in a "24 Hour Comic" session, see his 24 pages long wordless story at http://www.24hic.it/gallery.php?gid=152. At the same time, Zograf's comics travelogue from Budapest was published in important Italian weekly magazine Internazionale. Another occasion to view Zograf's work in a public space was BELEF (Belgrade Summer Festival) - the festival had made a proposal to artists from several countries to submit their works to be posted on billboards around the city area. One of the billboards in Despot Stefan Boulevard featured Zograf's drawing from his story about Jonathan Richman. On May 7th, an exhibition of Aleksandar Zograf's comics was opened at the Glasnik gallery/bookshop/bar located downtown Belgrade. It was occasion to present some of the latest works including weekly comics from Vreme, and (in a bookshop section) a fresh copy of Zograf's latest American book, Regards from Serbia (among the latest reviews is the one published in San Antonio Current and a review published in The New Mexican magazine. Speaking of travelling shows, a comics exhibition titled POOR IS A COUNTRY THAT NEEDS SUPERHEROES TO SAVE IT was curated by Giorgio Santucci and Alessio Trabacchini for the INDaYs comics festival in Viterbo. The exhibition includes comics by Aleksandar Zograf and embroideries by Gordana Basta, along with works by some of the most interesting artists on the Italian scene ( Valerio Bindi, Sandro Staffa, Marco Corona, Alessio Spataro etc). The expo (some sort of superhero genre satire) was relocated to Naples' Palazzo delle Arti on May 24th, and will be on view until July 8th. Back to the local scene, it was a literary magazine Kvartal, from Panèevo, that published a couple of comic stories by Aleksandar Zograf, along with the illustartions created for this issue by French artist/cartoonist Johanna Marcade. Zograf was also present in the 15th, and the very last issue ofNOSOTROS SOMOS LOS MUERTOS, a comic magazine edited by Spanish comics great MAX; the farewell edition of NSLM includes works by Julie Doucet, Anke Feuchtenberger, Blanquet, and many others. From January 5th to February 5th an exhibition of Aleksandar Zograf's drawings and Gordana Basta's embroideries was held at COFIX, a combination comics library and café in downtown Thessaloniki. Zograf's presence on the Greek scene continues thanks to translations of his comics appearing in the pages of Athens' Galera magazine. At the Ottawa University Center, an exhibition 'Radoslav's Time' ( which includes Zograf's Radoslav's story, originally created for Vreme magazine) was opened in the presence of the diplomatic corps on January 11th. The concept and realisation of the exhibition were the work of the National Library of Belgrade. In February, Top Shelf publishers released Zograf's new American collection of comics entitled 'Regards From Serbia'. The book was commented on at length in interviews for Comics Reporter and High Hat ( http://www.comicsreporter.com/index.php/resources/interviews/7202/ , http://thehighhat.com/Marginalia/008/lanier_zograf.html ). This substantial volume includes reprints of comics originally published in the '90s by Fantagraphics, as well as material created for several magazines and web sites in the US and Europe, concluding with the story concerning Milosevic's death in 2006. The foreword to this collection was produced by Chris Ware, while the segment featuring Zograf's emails during the NATO intervention against Serbia includes an introduction by Monty Python's Terry Jones. The British magazine Redeye has published an interview and exclusive 10-page preview to mark the launch of 'Regards from Serbia'. A two-page color story concerning the history and present status of the town of Pancevo was created exclusively for Internazionale, an Italian national weekly magazine. At the same time, another Italian publication, The Artist, a magazine in the style of the 60s American underground comics, has printed Zograf's work, along with contributions by Foolbert Sturgeon, Hunt Emerson, Squaz, Stefano Zattera, and many more artists. In early March, Aleksandar Zograf was a guest in Ljubljana, where he both participated in a discussion marking the Slovenian translation of Joe Sacco's 'Safe Area Gorazde', and made a public appearance at the Buch comics book shop. In mid-March, Zograf and Basta were guests of the first edition of Bologna's BilBolBul comics festival, where an exhibition of Zograf's comics and Basta's embroideries was opened at Istituto Storico Parri. Zograf also spoke at Bologna's Pinacoteca during a conference held in the memory of Roberto Raviola alias Magnus, one of the Italy's greatest cartoonists. The reception of Magnus' comics series 'Alan Ford' in ex-Yugoslavia was the main topic of Zograf's talk, as well as of his essey included in a handsome monographic edition dedicated to Magnus, also launched at the festival. Zograf also provided a preface and an illustration for a collection of reprints of another classic of the Italian popular comics, a series entitled 'Comandante Mark', published by Milan's Edizioni IF. In late March, the Budapest comics festival featured an exhibition and signing of the Hungarian edition of Zograf's comics. 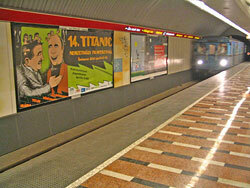 Zograf and Basta returned to Budapest in mid-April for the opening of the Titanic Film Festival. The official poster for this international movie festival, the single most important event of this kind in Hungary, was designed by Zograf. He was also among the speakers who opened this event at the magnificent art-deco building of Urania cinema and was proud of the fact that his posters were visible all over city, including the billboards in the metro stations. As recently as April 19th, Zograf was at another opening in Paris, where the Cultural Center of Serbia was presenting his works as part of the 'Radoslav's Time' exhibition. During his stay in Paris he also made a short film segment to be presented as part of a 'Toy Comics' exhibition sheduled for November at Musée des Arts décoratifs.